This is an English locational or residential surname. Recorded as Allingham and occasionally Elingham or Ellingham, it is what is known as a "lost" village surname. 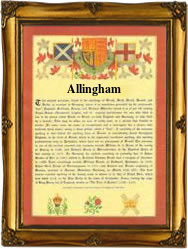 It originates from either Allingham, now a suburb of the city of Bradford in West Yorkshire, or from Allingham Hall, formerly Allingham village, near Shrewsbury, in the county of Shropshire. Both villages have or had, a similar Olde English pre 7th century origin. This is the tribal name Aella or Aelda, with "-ing" meaning people of, and "-ham", the homestead or settlement. "Lost" villages are a feature of the British Isles. It is estimated that not less than five thousand surnames do originate from places that have disappeared from the maps over the past five hundred years. The reasons are complex, but can usually be explained by changes in agricultural practice mainly in the 18th century, and more recently, increasing suburbanization. However the great medieval plagues and even war, have played some part. In this case examples of the surname recording taken from early surviving church registers of the diocese of Greater London include: Kather Elingham, a witness at St Botolphs Bishopgate on September 30th 1594, and Margery Allingham, who married John Bourder at St Mary's Putney, on September 19th 1645.